The Fat Tuesday parade is the biggest parade here. Also known as the Mardi Gras parade, famous throughout the world as an occasion for wild abandon. In New Orleans, they throw beads. Here, they throw flour. 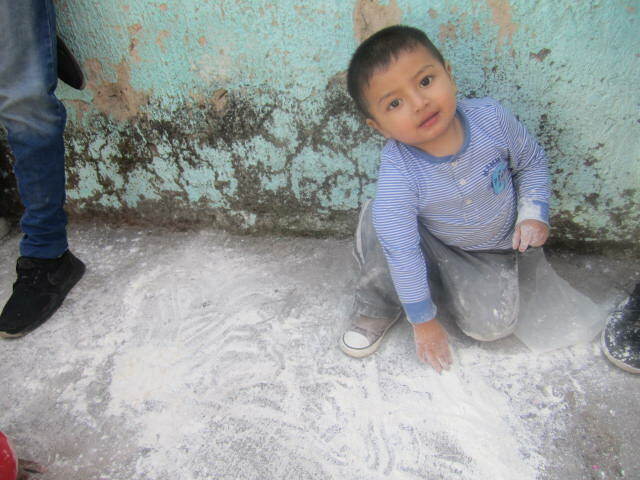 Flour is much less expensive than beaded necklaces and far more fun. Meaning that flour is a real mess. After the parade, all along the parade route, it looks like there was a snow storm. And what a mess it must be to clean up. The day of the Fat Tuesday parade is called Strove Tuesday. It is the day before six weeks of Lent. Ash Wednesday is the next day. Carnival in Latin means Farewell to the flesh. No more meat. No more fun. Just prayer and fasting and penitence for the next six weeks. I started out slowly with these photos. the first ones are of people waiting for it to start. As this article progresses, so do the photos until the end where it is just a mass of humanity, covered in flour. Fun for everyone. There were hundreds of people lined along the parade route, waiting for it to start. Young and old people were there. 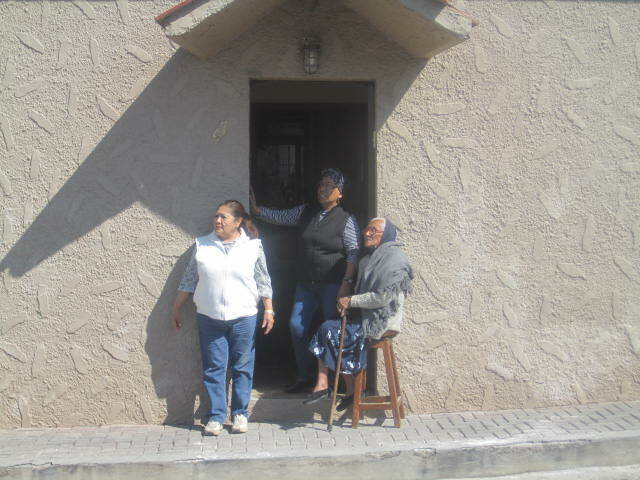 I liked the photo above of the elderly woman waiting and watching for it. I wonder how many of these parades she has witnessed or even been part of in her life time. 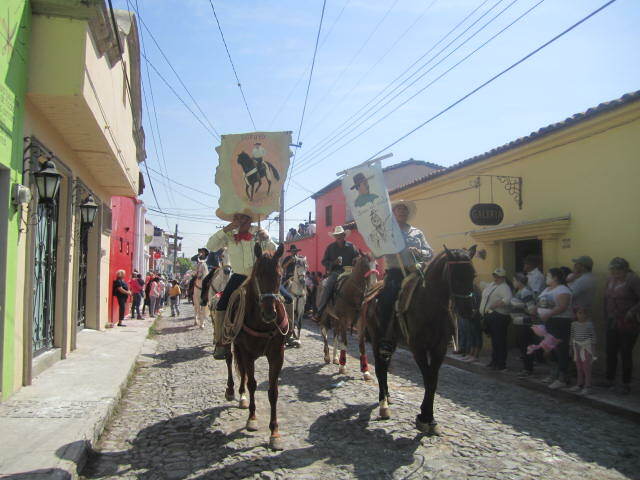 Above is a photo of some Sayacas, before the parade. You will see them further in this article, not so calm, chasing the boys. 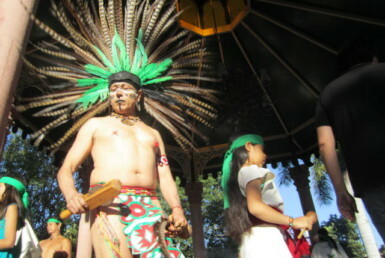 Sayacas are usually men dressed as women. 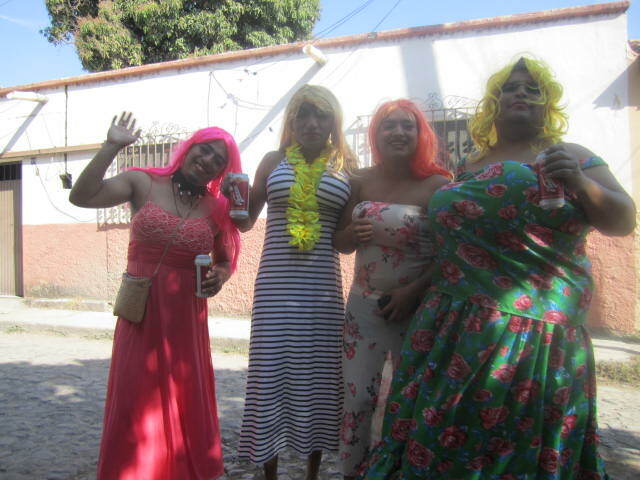 But in this photo, I would not venture to say if they are men or women. All I can say for certain is that they are already having fun and the parade hasn’t even started yet. 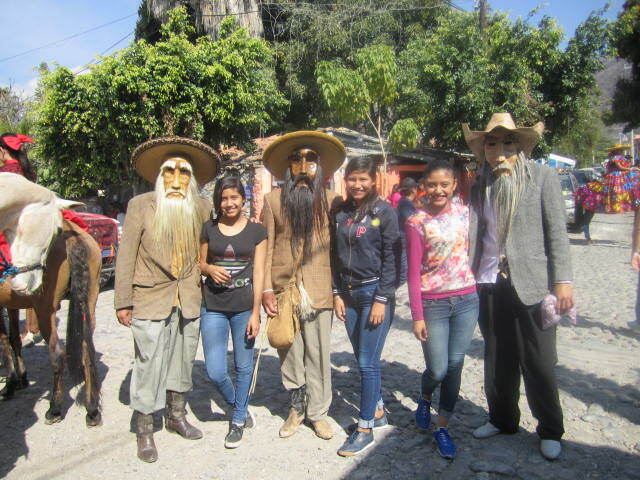 Above are three Sayacos with their women friends. 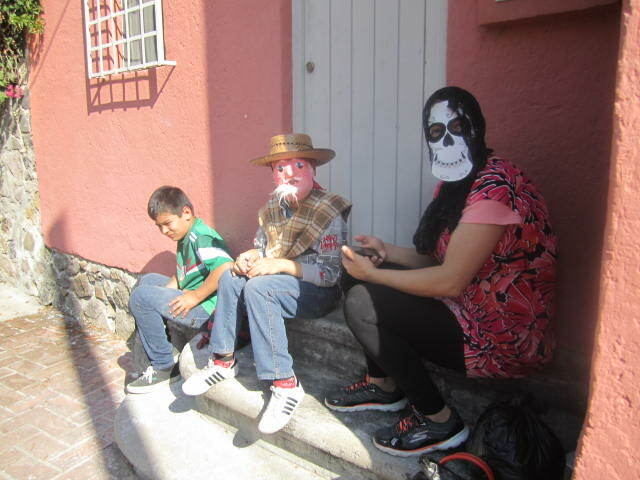 Sayacos wear masks of old men. They also chase people and throw flour at them. 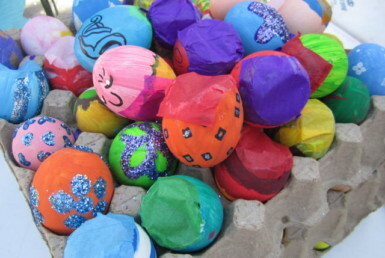 Sayacas and Sayacos originally were created to make fun of the wealthy Spanish. I learned something new this year at the parade. I am passing this along to you, if you come here to see the parade. 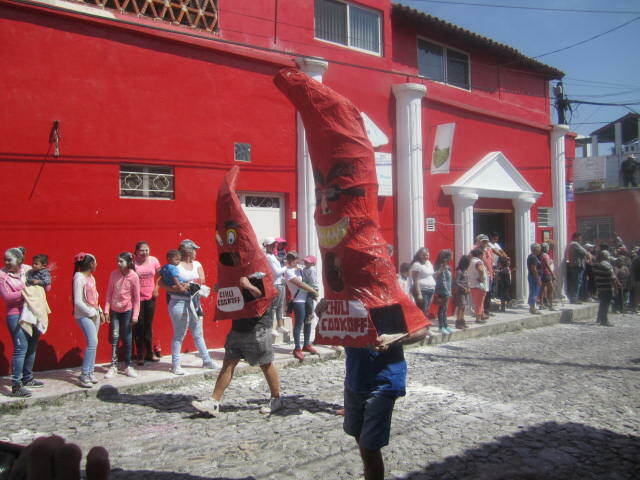 If you do not look at these flour throwing creatures, they mostly will ignore you. If they see you taking photos of them or looking directly at them, then you are in for an assault of flour. And usually it is thrown at your face. Not so good for the camera lens. I also like to hide behind objects or other people. I don’t mind flour on me but I worry about my camera. This year there were lots of horses. I don’t remember any other parades with so many horses. And I don’t remember another parade where the horses came first like this one. Not so good for the people walking behind all those horses. I could have made an entire article on just the horses and riders. But I wanted to get in other things too. My favorite horse is that black one second from the right in the above photo. 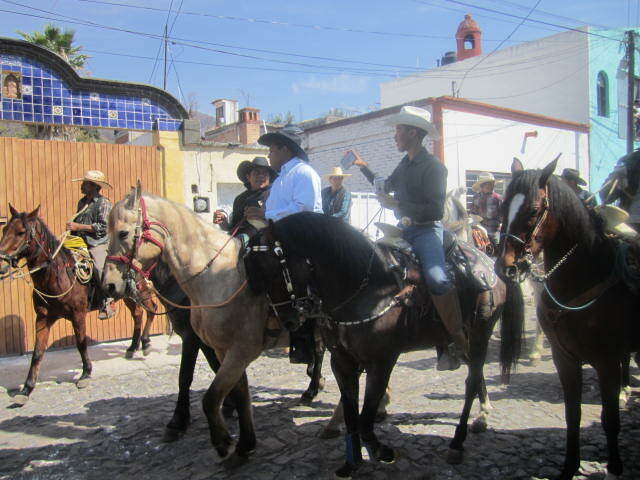 Some of the horses danced along the route. You can see one cowboy with his cell phone. It looks like he is taking pictures with one hand and drinking something with the other. His horse is being very patient. 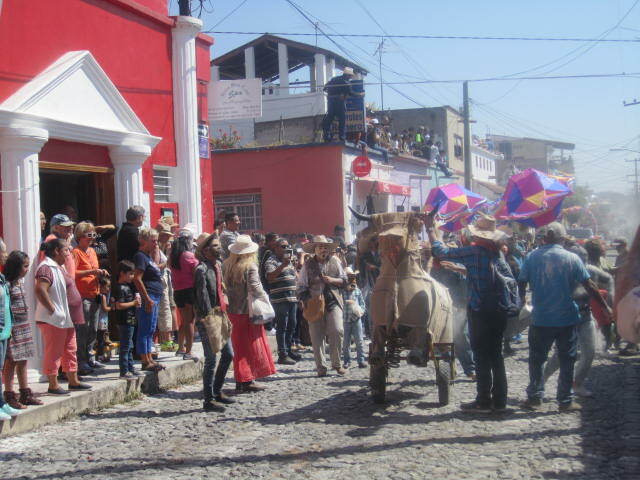 Every year after the parade there is a performance at the bull ring of the Escaramuza riders. These beautiful young women ride sidesaddle . 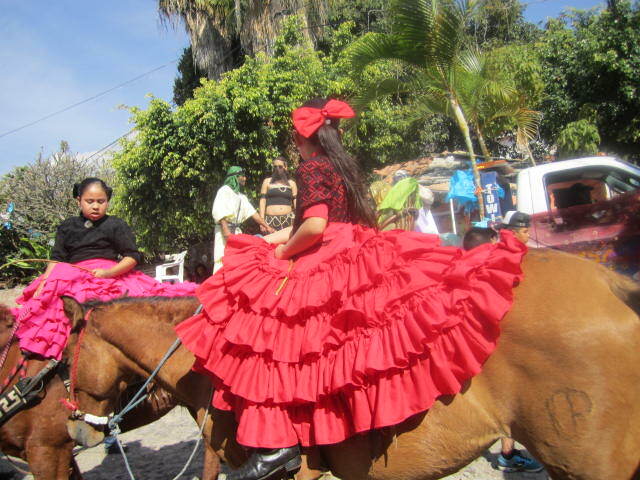 Their skirts and dresses are elaborate and their riding is even more so. They ride directly towards each other in many different formations. It is fun to watch. But after the parade I was too tired to go there. Maybe next year….. 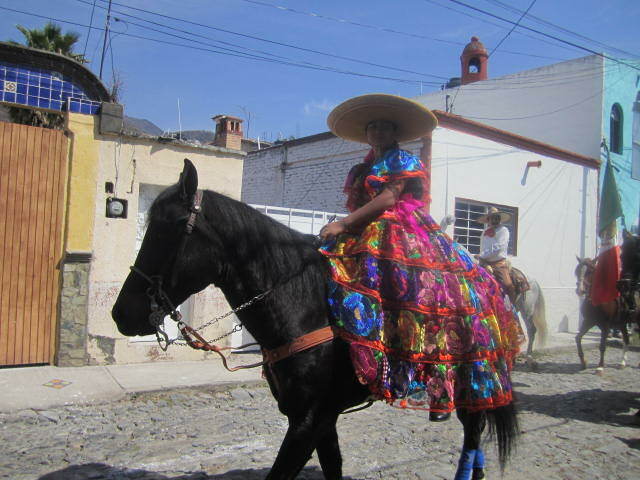 I noticed that the above Escaramuza rider was the only one wearing that pattern of dress. All the other riders had dresses that were matching. Maybe she was the leader of the group. I don’t know much about these riders. I do know that she was a regal figure in the parade. The above photo is just a few of the running boys. That is the best part of the parade for them. 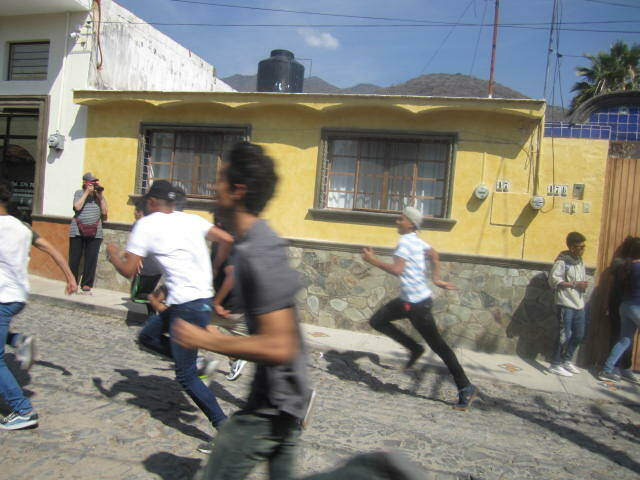 The excitement of running and being chased by the flour throwing Sayacos and Sayacas. But be warned. Do not stand in the street because these boys get so excited that they don’t pay any attention of where they are running. You could get slammed by them. That would be far worse than getting flour in your camera lens. I would rather have a broken camera than a broken body. Priorities. 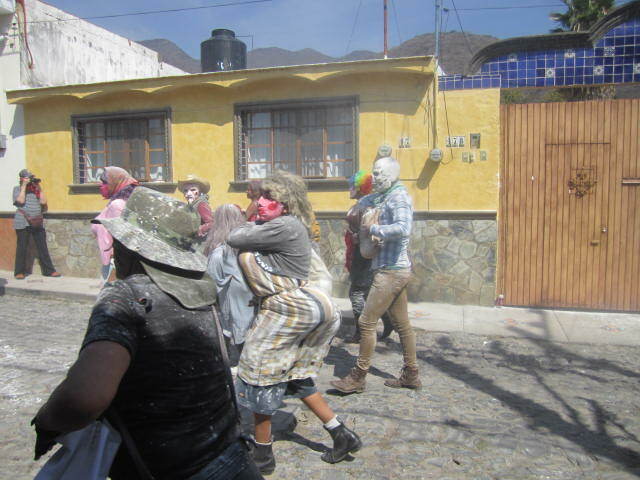 In the above photo you can see the Sayacas and Sayacos at work, Chasing the boys and throwing flour at them. They were at one time also called, Masked Marauders. You can see why from that photo. Remember that group of Sayacas at the beginning of this article? 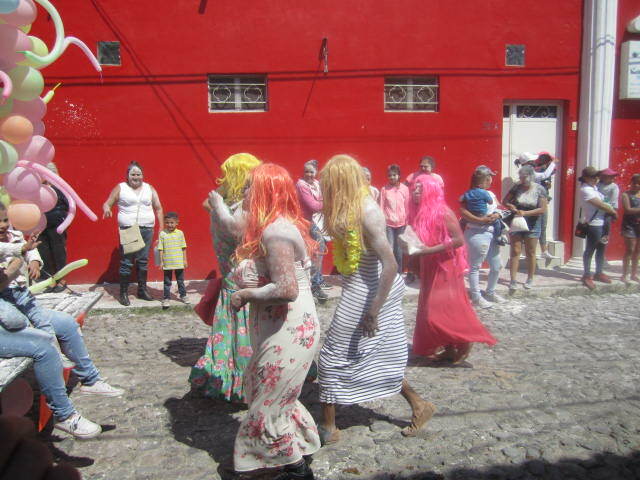 Well, here they are now, doing their mischief, throwing flour at everyone. 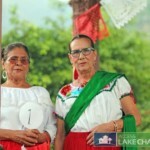 Can you tell yet if they are men or women? 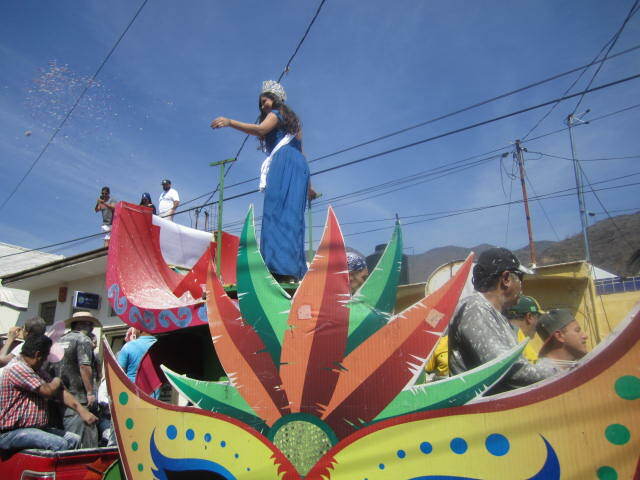 Above is a photo of the queen of the parade. She was standing on a float that had men sitting in the back and the front of it. 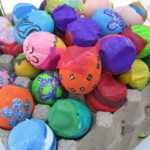 All of them were covered in flour. I guess she was too high up to get any on her beautiful dress. She was throwing candy. That was a relief after all the flour coming from the people in the parade. Check out the band members in the above photo. I was worried about my camera but I see that the instruments were taking a flour beating. 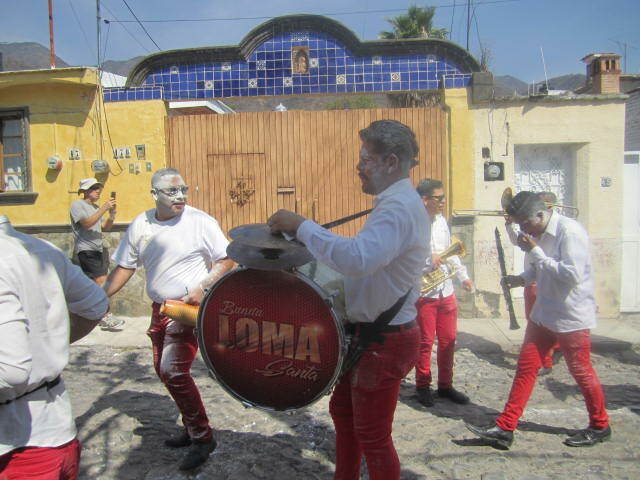 The young man with the clarinet was spitting up flour. I enjoyed the above float. 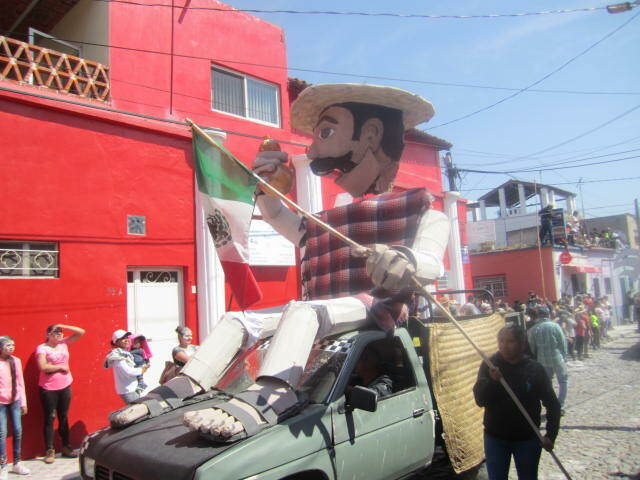 The man walking along on the right side of the truck had a stick that he moved back and forth that made the Mexican flag wave. 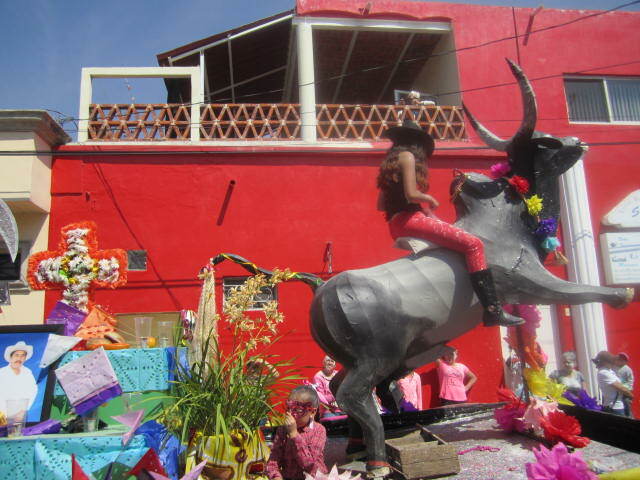 The young woman on the bull was throwing small pieces of confetti to the onlookers. There was an altar set up on this float for one of the cowboys. He must have passed away recently. I didn’t get a name because it went by so quickly. 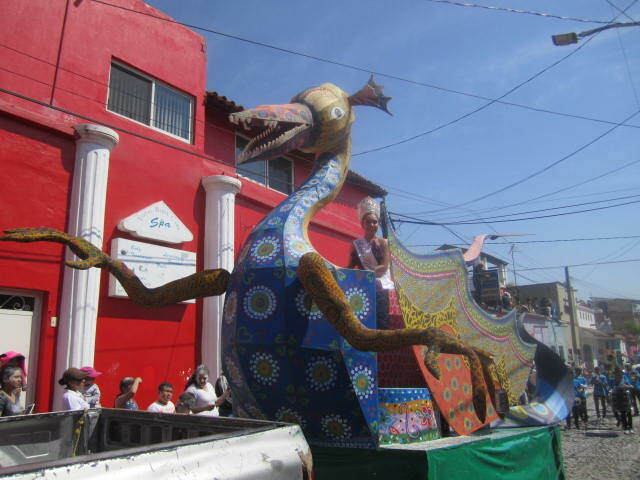 But he must have been well loved to have had the altar honoring him in the parade. It was fun watching people on their homemade horses. At least the band coming along behind them didn’t have to worry about what the real horses left in their wake. And another pretend animal. This time a bull. And it was scary for anyone brave enough to jump on it’s back. The man behind, holding the handles that made it go up and down, would make it buck and at the same time the rider was pelted with flour. Not many people stayed on it very long. Above was another float with yet another queen of the parade riding on it. For some reason that float managed to escape the flour pelting. But check out the next photo. 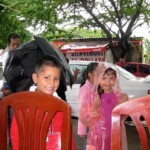 Notice that enormous bag of flour that the young girl is dipping her hands into. the bag is already almost empty. I wonder how many of those bags this one float went through as it traveled down the route. I liked the hot chili peppers. They were advertising the upcoming Chili cook off. It will be held from Friday, February 23rd through Sunday, February 26th. 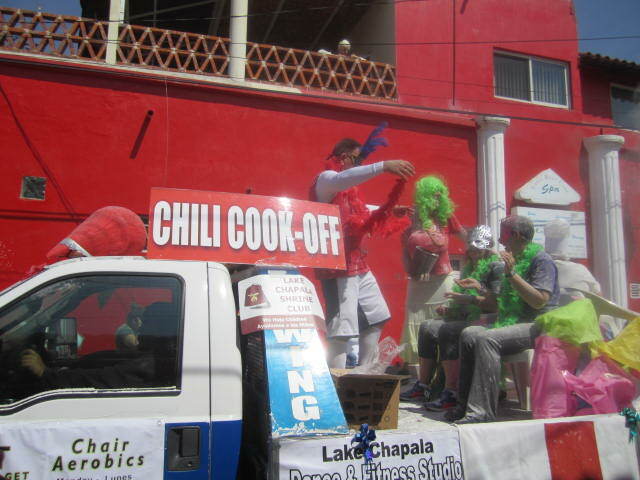 The above float was also advertising the Chili Cook Off. I will be there and my next article will be about it. I was covered in flour when I managed to call up to my friend to let me into her front door. She was watching the parade from a safe distance from her balcony. She wouldn’t let me up her stairs until I had half undressed and shaken off all the flour on me. 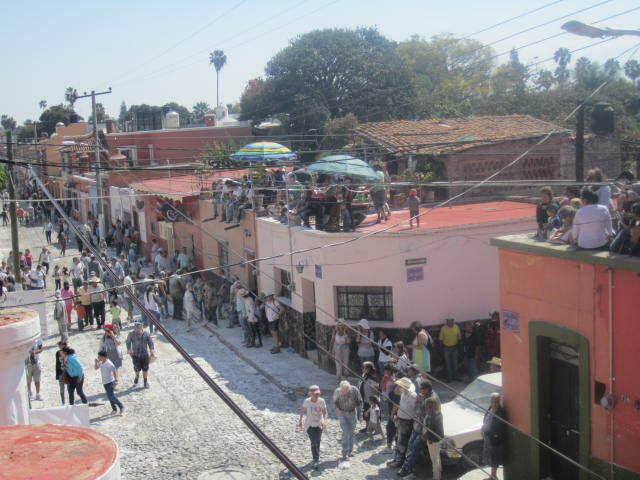 I was glad that I could get a photo from her balcony to show the street. It looks like it has snowed in Ajijic. Imagine if you lived on this route and you had to clean it up the next day. 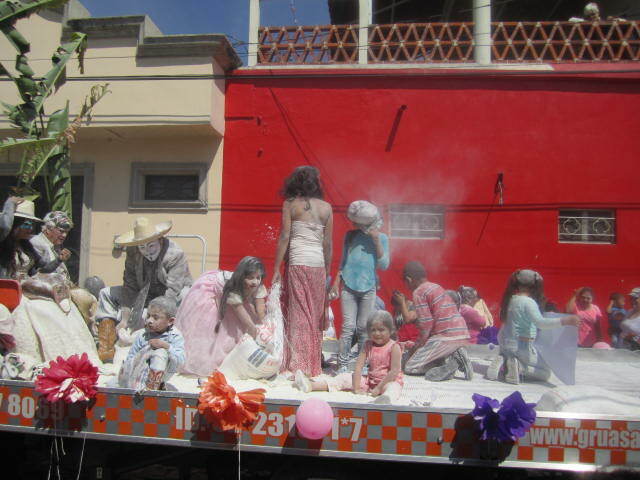 The little boy in the above photo was doing his best to take care of the flour in his immediate area. Don’t think he did any cleaning up but he made some interesting designs with it. 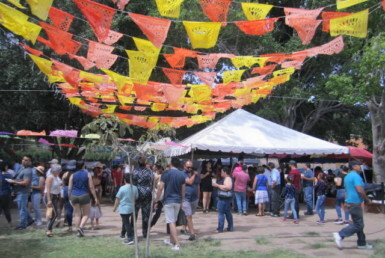 Another article about the Fat Tuesday is at an end. 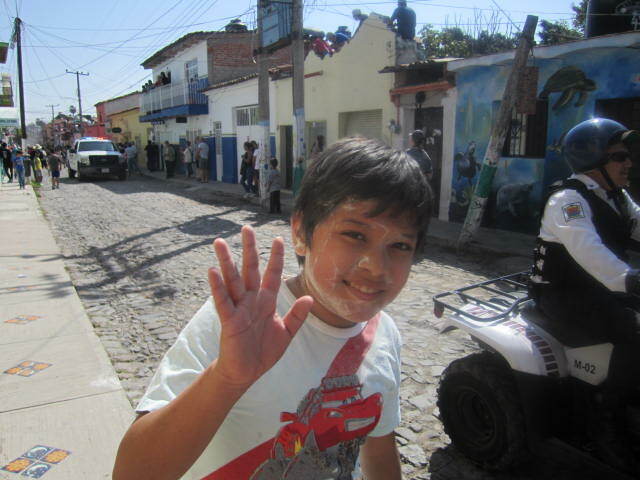 And I thought it was appropriate to put on this photo of the flour faced boy waving goodbye. Next to him was a policeman riding on his three wheeled vehicle. Behind them was a police truck. I hope you enjoyed these photos and maybe next year if you didn’t make it to the parade you will be there. Adios until next time. 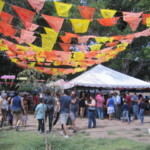 I am coming to Ajijic for the first time in 2 weeks time and so looking forward to it! 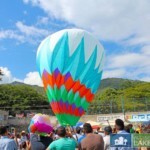 I was introduced to the town by a work colleague and did much research on the area…..I LOVE IT! I love reading your blogs, seeing the photos, and want to explore and yes, walk and walk and walk. 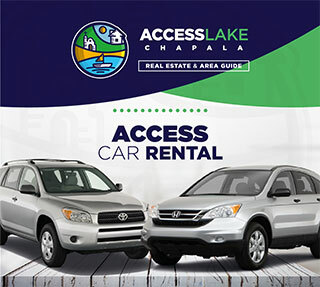 Lake Chapala is a lot of fun that can make even the oldest feel young. My husband and I are looking forward to move early next year. 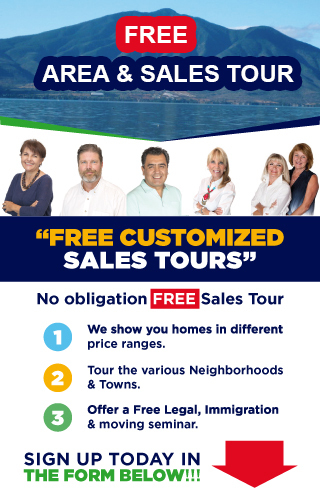 I like to make some friends via email before we move and chat about things to know about living in Lake Chapala. 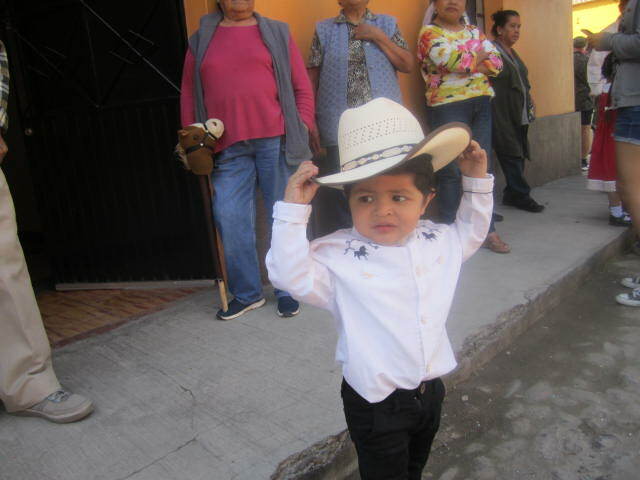 We are a spanish-american retiree couple from Texas and now living in Cuenca Ecuador.